I picked the flowers for today’s vase yesterday evening. Still daylight and warm (well, warm enough not to wear a coat) at 8.30pm, it felt as though June had finally properly arrived. After a week of grey, the sun has come out, the wind has dropped, the temperature has risen and all the gloom has been swept away. Bliss. Cue much work on the terraces in the front garden. We dug and picked through masses of soil this weekend and I never want to see another piece of bindweed, Japanese anemone or bramble root again (we filled a 1-tonne builder’s sack…). My gluteus maximi are definitely feeling it today! :: a few tendrils of wayward honeysuckle (unknown variety) growing by the front steps for added greenery. Hope the sun is shining where you are. Have a lovely week. Joining in, as usual, with Cathy at Rambling in the Garden and all the other bloggers from around the world for her popular weekly gathering of vases. I’m glad to hear you are getting some sun. It was sitting on a leaf, wings out, soaking up the sun, so I got a good, long look at it. Beautiful. Such a beautiful vase…I love daisies of all colors and kinds. I wish my climate made growing Cape Daisies easy but they do not like our weather. That’s a shame, Donna, because they’re such easy-going plants. I’m glad to hear that the weather has improved lately. Your bouquet is beautiful this week. I love the vase too. You’re very good at this, putting together interesting flowers and greenery. They always look good. Thank you, Jennifer. That’s lovely of you to say. I love the shape of the vase you’ve used today, lovely display of daisy flowers, I love them too, they’re the flowers a child would draw aren’t they, such fun. Glad your weather has improved; it’s much hotter here today but still threatening thunderstorms. I’m indoors working this week so I’m trying to ignore the garden and the weather (although it is raining and thundery right now!). And I have had a stack of wet weather creative jobs which had been put on hold but have been cracking on with them this week as it has been too hot to be outside! It’s a very pretty mix, Sam. 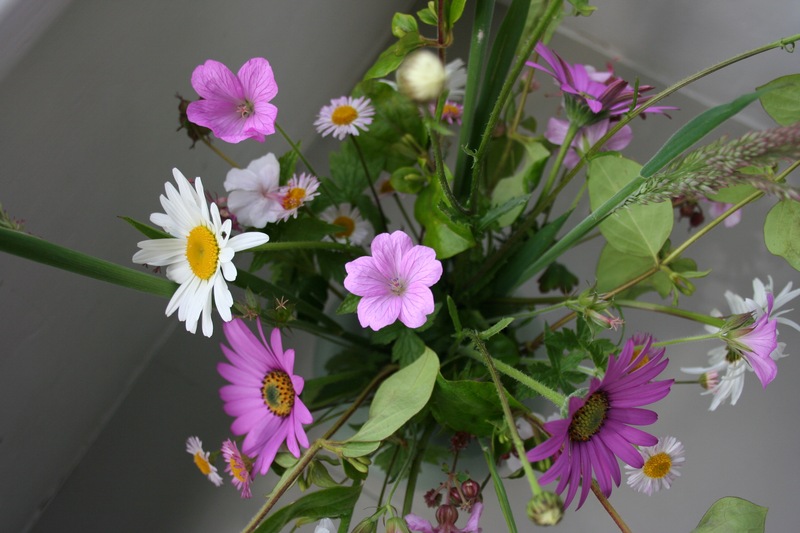 Do the Osteospermum last long in a vase? As many as I grow, I’ve never cut any for a vase. I’ll let you know! They seem fine so far (2 days and counting). I love the shapes you’ve made here with your lovely daisies and grasses. I also cut some pink feathery grasses today but must have dropped them because they didn’t make it home. Good job on all that weeding. It is definitely easier to tackle tasks like that when the sun is shining and muscles are warm. Hope you have a relaxing week Sam with lots of walks in the sunshine. Thank you, Sarah. I find weeding strangely addictive (which is good, I suppose!). This is a lovely mixture of ‘daisies’. I am new to erigeron this year, but after regularly seeing it ‘soften’ steps in magazine articles I’ve planted some in a trough. I saw my first painted lady today. It was a little tatty, but still beautiful. Thank you :-). 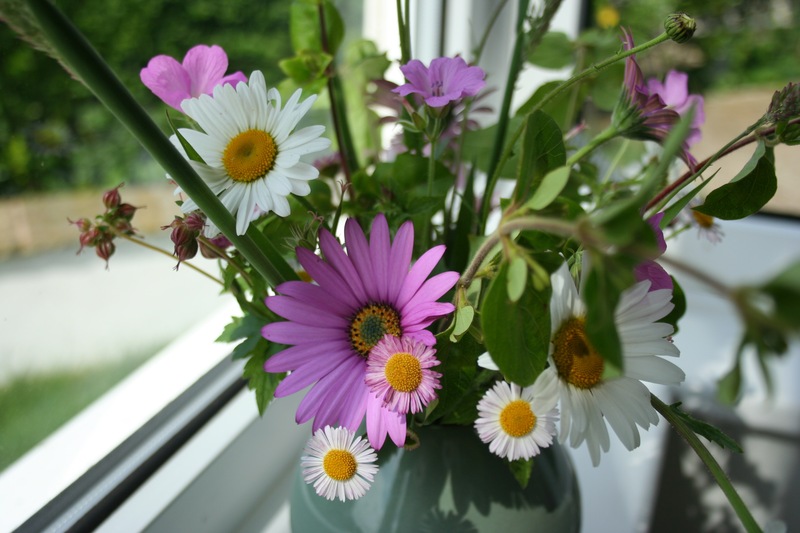 Erigeron is one of my stand-out, favourite plants – so unfussy, hardworking and beautiful. 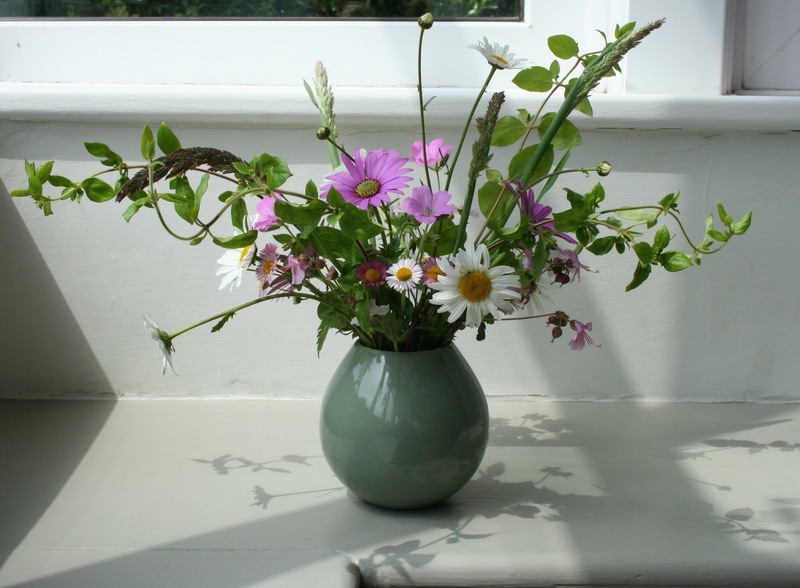 I love daisies and the way you have arranged them in your vase keeps show off their fresh and wild look. Beautiful!! Nothing else to say, other than BEAUTIFUL! Japanese Anemone? Umm … I just planted three. Deliberately. As for your arrangement, it is daisyriffic!